Shanghai Disneyland has some nifty snacks, though they’re very much on the bread-y side so they may not be great if you’re on a diet. But let’s be real, part of theme park experience is eating all sorts of unhealthy things! For example, this Mickey donut was big enough to be my entire breakfast. You can’t quite see the scale of it, but it was as big as my face and really filling. It may be called a donut but really, it’s cake generously coated with white chocolate and sprinkles. It’s good white chocolate too, not that oily fake stuff. It’s 55 CNY (S$12) from Snackin’ Kraken in Treasure Cove. Snackin’ Kraken is an outdoor stand, opposite the Doubloon Market store. Some of my favorite snacks in Shanghai were savory. 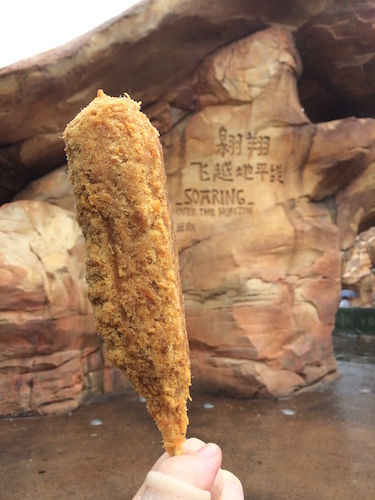 Like the floss corn dog (45 RMB, S$9) from the outdoor cart outside Soaring Over the Horizon in Adventure Isle! It was so good and made all the better by having to huddle under an umbrella to keep it out of the rain. It actually tastes better than it looks cos the yummy pork floss was squished by the wrapper. Watch out for your clothes! It’s a bit messy, but luckily I was wearing a raincoat. This was probably my favoritest thing because the floss was a nice contrast to the bite of the sausage, and it was lovely and warm. Pork floss is well-known in Singapore, but I’m not sure about elsewhere? It’s what you get when you cook out all the moisture from pork. You’re left with a very umami meat fluff that’s almost a savoury cotton candy. It just melts in your mouth. It’s especially good on porridge! If pork floss isn’t your thing, stop by Fantasyland to grab yourself a soft Mickey pretzel. It’s served warm with a packet of mustard, and it’s so tasty. The pretzel is soft and warm with just a touch of the salt on the outside. The pretzel is 30 CNY (S$6) and you can find it at a food cart in between Fantasyland and Treasure Cove. I supplemented my Mickey pretzel with a Monsters, Inc. cranberry bun from the main bakery (25 CNY, S$5). Location-wise, this is a bit tricky to pin down since it’s not marked on the online map. But let’s try. From Gardens of Imagination, stick to the main road that leds to the junction of Fantasyland and Treasure Cove. (This is more or less the end of the parade route – if you pass the Fantasyland info kiosk, you’ve gone too far.) At the junction, head left into Fantasyland and it’s the nondescript and unassuming food cart! If you don’t want to hunt down a random food cart, each sit-down eatery usually has a dessert item unique to that area. Mickey & Pals Market Cafe is right next to Whistle Stop Shop, the store that specialises in Duffy the Disney bear goods, so of course they’d have a Duffy-shaped panna cotta! It was a milky pudding with a light, spongy cake base. It’s a sweet treat to end a lunch, and won’t break the bank at 30 CNY (S$6). If you prefer cakes, there are two major shops in Mickey Ave to check out. Remy’s Patisserie is the main bakery. You’ll find various types of sandwiches and themed buns. Not my personal favorite since I don’t like western-style bread. I find it too hard and dry, but they will keep well if you’re running around the park. Sweetheart Confectionery has a stronger focus on sweets like cake pops, giant candied apples, and rice krispie treats. The candied apples are enormous and you’re really getting your money’s worth (50 CNY, S$10 – so that’s quite a lot of apple). I got this very cute matcha cake pop from them! It was very dense and moist like a no-bake cake and reminded me of a sticky pudding. Cake pops may not be your thing, but if it is, you’ll be paying around 20 CNY (S$4) for this deliciousness. Speaking of character-themed items, I was curious to see if Shanghai had inherited Tokyo’s interesting popcorn flavors and adorable buckets. Sadly, there was only one design of popcorn bucket and only regular caramel popcorn. You can get these at various popcorn carts throughout the park. Make sure to save space for the classic Disney snack: ice cream! A Mickey ice cream (40 CNY, S$8) was basically mandatory. And of course, you can get some great shots if you happen to go to the ice cream cart near the Castle! Because China has a strong dairy culture, the ice cream is rich and creamy. Speaking of classic Disney snacks, Shanghai has the turkey leg too! A little further down from Snackin’ Kraken (where you get the Mickey donut) is another food stand, Tortuga Treats in Treasure . Most likely, you’ll see the very long queue first. I thought it was for a ride, but turns out that this is the only place that sells the iconic Disneyland giant turkey legs. They only open as batches of turkey legs are ready, so take note of the next timing if you want to get your hands on one! Each turkey leg is 80 CNY (S$17) and it’s limited to 2 per purchase. The queues were always so long I never actually got to see one. Turkey’s also not common here in Asia, so I suppose that all contributes to the huge demand. I’m saving the turkey leg for my next trip. There were still a couple of things I didn’t get a chance to try, like an ear of roasted corn with cheese and bacon, and spicy Sichuan pork leg which smelled amazing. I spotted different types of corndogs too! All things considered, I’d say Shanghai has pretty decent snack game, though not quite on Tokyo’s level yet. The snacks are kinda expensive when you compare them to the ‘real food’ meals, which are generally 70-90 CNY (S$15-19). They’re pretty big though, so you could share or have a large snack instead of lunch. Anywhoo, that’s it from me! I hope the guide has been useful and if nothing else, it’s a decent addition to the few English guides out there. Just bear in mind that Shanghai is already fantastic, just a little rough around the edges. Give it a little time, though, and I’m sure it’ll rise to the occasion like one of their delicious pretzels! 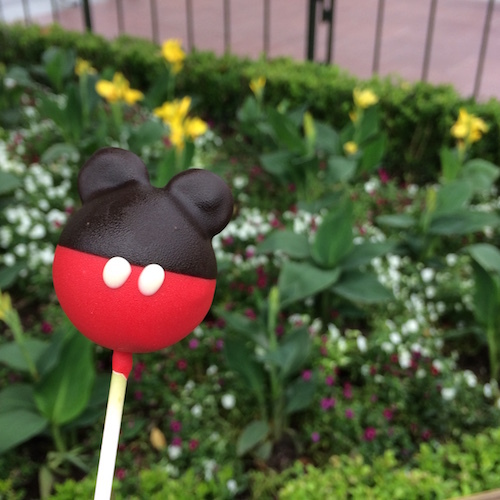 2 comments to Shanghai Disney Resort, Part 3: Snack Time!